Kenneth Allen Scott was born in 1891 to X.C. Scott, a physician, and May Allen Scott. He graduated from University School of Cleveland in 1909. Activities there included the Mandolin Club, manager of the Musical Club, and the School Council. He then pursued studies in civil engineering at MIT, from which he graduated in 1913. His thesis was titled: "Design of a Strauss Steel Trunnion Bascule Bridge", a type of structure familiar to Clevelanders. Mr. Scott went into business for himself as a broker and/or owner of Great Lakes cargo vessels, with offices in the Union Commerce building. It is believed these ships were used primarily for shipping bulk cargoes such as coal and iron ore (etc.) up and down the Lakes, through the Soo Locks and Welland Canal. Then as now, Cleveland was a center for Great Lakes shipping interests, with numerous companies headquartered here. Mr. Scott maintained homes in Alabama, northern Wisconsin, and Cleveland's Moreland Courts, was a member of several clubs here and in Duluth, MN, played the piano, and may have ridden horses. But his real passion was dogs, especially German Shorthaired Pointers, which he showed at the annual Maytag Plantation field trials. He also took in and cared for stray dogs. There were ten dogs at his Alabama home when he died. One year, Mr. Scott found that a dog needed treatment for an enlarged heart, and took it to the nearby College of Veterinary Medicine at Auburn University. 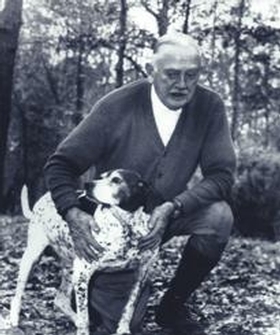 In an early example of his philanthropy, he began providing support to Auburn for the study of disorders and diseases of small pet animals, and pledged to match memorial gifts made by veterinarians and others. This funding stream created the Scott Research Grants for graduate students. Years later, the example set by Kenneth Scott resulted in a major bequest to the University, underwriting establishment of the present Scott-Ritchey Research Center at Auburn. Mr. Scott retired in 1954, liquidating his shipping fleet assets ahead of the building of the St. Lawrence Seaway, and died in 1977 at age 86. Married and divorced twice, he had no children. In 1970 Mr. Scott executed an agreement providing for creation of a charitable remainder trust with several beneficiaries. Following the passing of the last of these, the Kenneth A. Scott Charitable Trust was incorporated in 1995 to carry on his philanthropy in perpetuity. It began making grants the following year as a private foundation with IRS tax exempt status. Since its inception, the Foundation has distributed more than $20 million in grants to nonprofit organizations in Ohio, other Great Lakes region states, and Nationally for activities that prevent cruelty to animals and promote the humane treatment of animals. As one of the largest animal protection foundations in the country, the Kenneth Scott Charitable Trust played a leadership role in helping found the Animal Grantmakers (AG), an affinity group of some three-dozen animal sector funders; and the Alliance for Contraception in Cats and Dogs (ACC-D), which promotes the development of humane non-surgical means for companion animal population control. The Foundation is also a member of Philanthropy Ohio.